Valparaiso, Nebr. 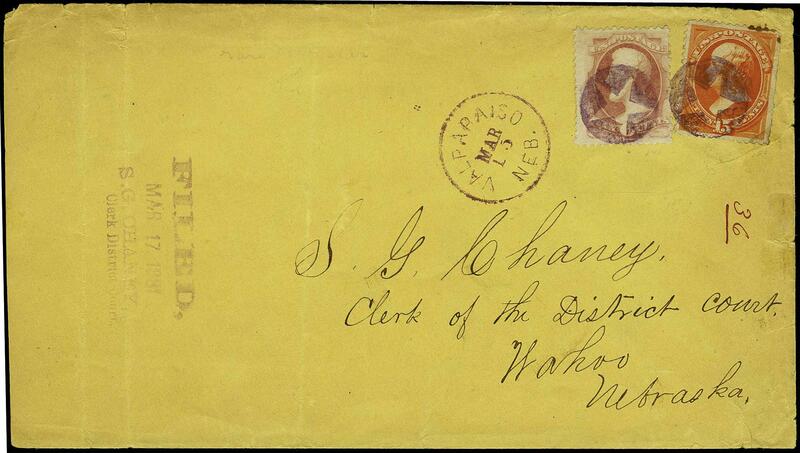 Fancy Negative 5 Point "Star", identical purple fancy cancels on 6c (186) and 15c (189) on reduced court cover to Wahoo, Nebr., matching Valparaiso, Neb. 3/15/(81) cds, purple "Filed Mar 17, 1881, S.G. Chaney, Clerk District Court" handstamp, 15c with minor flaws, Very Fine cancels.